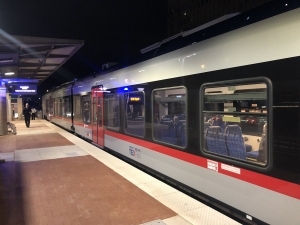 FORT WORTH (WBAP/KLIF News) — The new train connecting DFW Airport to Downtown Fort Worth is officially up and running. The TexRail ran for the first time Thursday morning at 3:25. Some showed up to go to the airport, while others wanted to simply be part of history and see what the train had to offer. “We were going really fast, but there was still no noise and no bumps,” said Conrad Schlenker, who rode the train with his father from Grapevine to Fort Worth and back. “It was really smooth. The train gets from Downtown Fort Worth to the airport in less than an hour — something Schlenker’s father said will be a game changer. The TexRail is free to ride for the remainder of January. Beginning February 1st, it will cost $2.50 for a single ticket, and $5 for a day pass. The train begins running every day at 3:25AM from Downtown Fort Worth, and has trains leaving the Texas & Pacific Station every hour until around 1:00AM. It was set to open last weekend, but a problem with a signal delayed the opening until Thursday morning.